No, my dear fellow Anti Fed Ed Warriors, you’re not seeing a pretty picture in the featured shot today, but let’s face it, the modern education reform is downright UGLY. What you actually see in the picture is what’s known as ‘pitch’ or ‘resin’. It’s gooey, it’s ooey, and it sticks to EVERYTHING. Much like the CCSS Machine’s grasp on our schools..
Once pitch or resin gets in your clothes, forget trying to get it out. It’s stuck there. Common Core (or whatever the heck it’s been re-branded as) is the same way. It’s stuck, it’s NOT going away anytime soon. Why? Too much time, effort, research, and money has gone into proving the ties to the UN. It’s because of that one simple truth, America’s stuck in an ugly educational mess. Warriors, you got to see the contrived ESSA State Plans and the big set-up they are turning out to be. You got to see 2 States, AZ and ND. One has re-submitted their ESSA State Plan (ND), that I know of AZ has not re-submitted theirs. In that article, Warriors, you also learned that SEL (Social Emotional Learning) seems to be one of the biggest types of ‘pitch’ being thrown at us. The other biggest type of ‘resin’? Oh, that would have to be the digital/technology workforce training. If your State hasn’t turned their ESSA State Plan in, their days are numbered. Sept. 18th is the absolute last day for the States to once again, bow to the federal government. Warriors, pitch has gotten on the knees of our Governors and State leaders. Otherwise why would they be stuck in the federal ‘Mother May I?’ cycle? So, what can I possibly add to the ESSA State Plans? What if I told you I’ve got some new evidence from North Carolina’s State ESSA Plan?! In other words, NC is the most pitch filled when it comes to being stuck to the CCSS Machine! 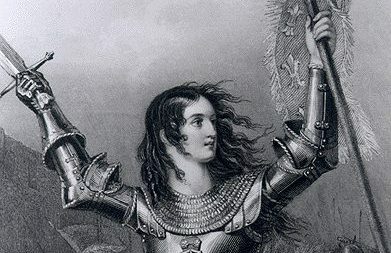 Warriors, even if you are not a fellow resident of mine, here in NC, I’m sure what I share will help you to ask some very crucial questions within your States. 1) HB 634 “Private Alternative Teacher Preparation” is the name of this federally laced bill. Wait, Lynne, how from the title can you tell this NC-specific bill that there’s a federal ‘pitch’? Warriors, do you see the SEL strings? What about the PBIS (Positive Behavior Intervention System) strings? BOTH SEL and PBIS are mandates in ESSA! Both these mandates are also in every global education program. Now, let’s back up and look at the timeline for NC: turn in the ESSA State Plan before OR on 9/18. The Legislature goes back into Session 10/4. According to those dates, the ESSA Plan won’t have had time to be accepted or rejected, but this bill will be on the table! Further on in HB 634’s language you can find that the candidates must have turned in their applications by 8/1 to qualify for consideration. Again, look at the timeline, Warriors. 2) The Personalized Learning (PL) on hyper-drive. Warriors, in the previous article, I shared with you the KnowledgeWorks PL State-by-State document. NC’s ESSA PL Plans begin on page 93. Warriors, these ‘flexible practices, authentic assessments and responsive thinking’ all involve the same thing: CBE! An ‘added pitch’? Student profiles called ‘learner profiles’. Yet another way to data track and mine your student’s information, as well as use PBIS and SEL. NC Ed Cloud’s been with us since 2013. According to this 2013 Report, NC was considered a ‘gold mine’ of student data. (*Note: you will not see the NC Ed Cloud mentioned.) NC uses “Home Base” as well, in data mining. You can trace the Home Base and NC Ed Cloud intersection here. Warriors, especially in NC, what does this have to do with the NC ESSA State Plan? I point you to the NC DPI (North Carolina Dept. of Public Instruction) Information Technology Plan for FY (Fiscal Years) 2017-19. This Tech Plan ‘grandfathers’ all the previous data mining tactics! By this nature, they, too will show up in the NC ESSA’s ‘fine print’. If you do not live in NC, what is YOUR State’s Info Tech Plan? Warnings: The best and biggest data mining tool according to these type of plans? Assessments. Warriors, remember, ALL education choices use assessments. NC’s choice for these from both the NC DPI and NC DNPE (NC Dept. of Non-Public Education, where home education and private education are overseen) are ‘nationally-normed’. Warriors, ‘nationally-normed’ means aligned to Common Core State Standards (or whatever re-brand name you pick)! CCSS aligned assessments are codified in ESSA!! The main conduit: Title One funds, especially in early childhood education. Other ages/grades? Find that in this article I wrote while involved with another national group. ESSA’s mandates include the re-shaping of ‘low performing’ schools into charters. NC’s already made a State law which will make sure this happens. ESSA also has an increase of charter schools in each State as a ‘provision’. In NC Law, you will also see this Statute for HOW schools are identified as ‘low-performers’. From the NC DPI, how the funds for “Restart” model schools is to play out. 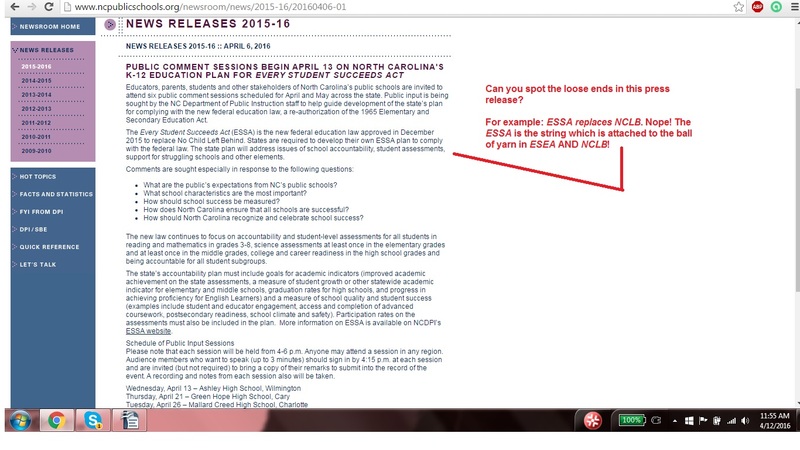 My raw notes which will show you data mining, SEL, and all which connects them to ESSA, from various NC sources. Get Your Free Money Here! Warriors Against Fed Led Ed, when you hear me mention the CCSS Machine, you know I am referring to the P3 (Public Private Partnerships) controlling EVERYTHING connected to education in America. Everything from the laws to the curriculum is included. When I say “Fed Ed”,though, are you thinking only CCSS (Common Core State Standards)? Fed Ed means SO much more! Here are the top examples: Common Core, Career Tech Ed, Career Tracks/Pathways, Career Clusters, Next Gen, STEM, College/Career Readiness, Challenging State Academic Standards, Future Ready, 21st Century Skills Ready, AP, IB, Dual Enrollment, Early College, Community Colleges, Public Universities, some Private Colleges, Learn to Earn schools, and all the other connecting entities/programs in PreK to Grad School. Because there is SO much ‘fed ed’, that means there’s LOTS of federal money (aka: your taxpayer burden) to be had. What’s more, is the CCSS Machine is just itching to help you not only SPEND that money in your schools, but can show you how to get it! Recently, I saw an article (link is below) about groups sold out to Fed Ed. These groups want to be the ONES to guide you to get the most E-Rate funding for your school possible. Knowing I’ve written at least 2 articles about how the federal government has used this seemingly innocent fee on your phone bill (or your internet bill) to ram CCSS Machine reform down our throats, I knew I had to find out more. Especially knowing how full of digital upgrades and technology purchases ESSA (Every Student Succeeds Act) has written in as requirements. ESSA has also tagged roughly $850 million just for these activities alone.That’s a hefty taxpayer burden, don’t you think? What happens when all that ‘free to your schools’ money runs short? Who picks up the tab? The citizens! Either through an increased tax burden OR a bond (taxes paid later over a long period of time). Trouble is, either way, those paying taxes now will be impacted as well as those who will be paying taxes in the future! Think of it this way, our money used against us in the name of progress/success/readiness. 1) The author, Heather B. Hayes, goes on to share top tips for schools to get all the access to the ‘free’ E-Rate funding. That is, after she laments that many K-12 schools aren’t lining up in droves to get this ‘free money’. 2) Mentioned in Hayes’ article are (Group #2) CoSN (Consortium of School Networking), (Group #3) Universal Service Administrative Company (USAC), and, The e2e Exchange (Group #4). B) USAC is also sold out to the CCSS Machine. gain discounts when purchasing digital services for your schools/libraries. 4) E-rate Funds will be spread out over the next 5 years. 5) The Funds are not meant only to be used for digital technology, but curriculum and other school wide accessed programs/services/resources. 6) Lots of ‘help’ is available to those school leaders applying..non-profits with CCSS Machine agenda are only happy to offer guidance through the mandatory 28 day bidding competitions. Warriors, no matter who is elected, ESSA and all its mandates, requirements, and related CCSS Machine member groups are going to keep going on with their agenda. We must use information like this to help expose this agenda. For today’s ‘From the Files’ article, we, those opposed to the overreach in education, will see if we can pick up any loose ends of strings the Common Core State Standards (CCSS) Machine has left around the nation. Could we make a ball of yarn with it? No doubt. Those backing the illegally based (now codified into law) education reform point to ‘no strings attached’, we need to not accept this fallacy quite so quickly. Why? Loose strings are not as loose as they appear. 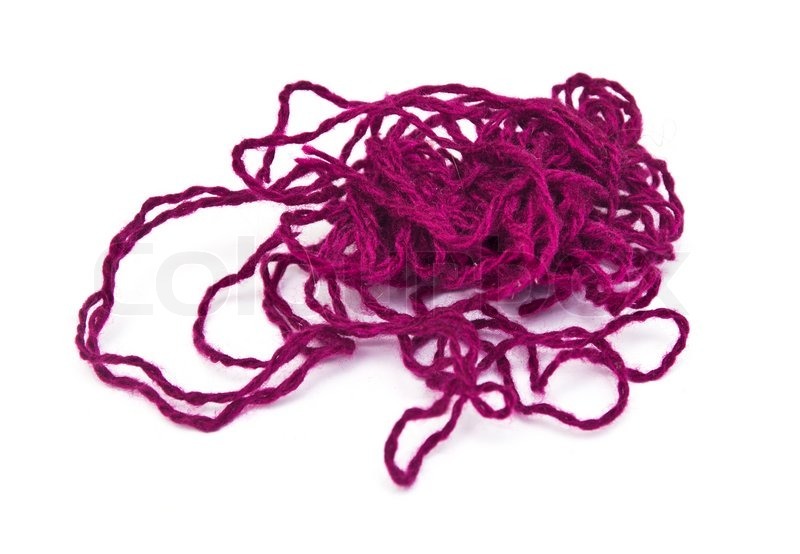 Somewhere connected to that loose string is a ball of yarn. What else is in the ball of yarn? Hidden programs, resources, funding, and MORE. As an example of how States are picking up those loose ends and extending them across our Nation, here is the press release the NC Dept. of Public Instruction about implementing ESSA. Below is the screen shot. In the caption is the link address. 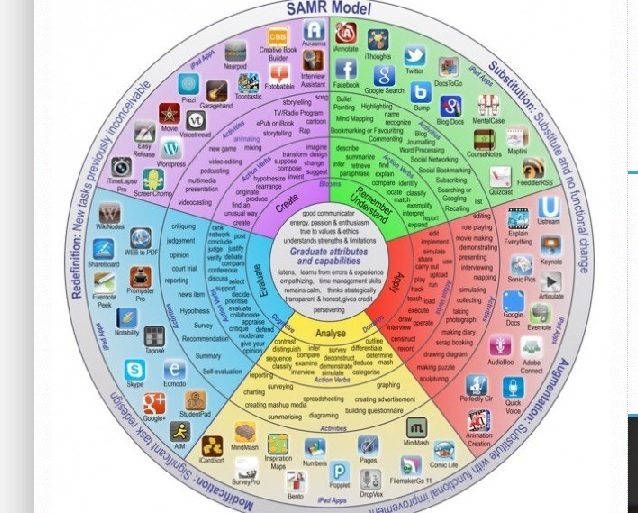 We Warriors must opt out of not only the assessments, but ANYTHING digital. This loose string portion of ESSA is a ball of yarn which will be used to knit a web of educational crimes against humanity. Yarn can be used to make many beautiful items. ESSA is not one of them. The CCSS Machine is using all its yarn to bind us up. Let’s be savvy. Let’s fight this. Let’s knot up the yarns as much as we can. ESSA molding education to become less than what it should be. In yesterday’s ‘Tech Thursday’ article, I gave you plenty of information about the CCSS Machine’s efforts via the ESSA (Every Student Succeeds Act) and digital education. In the ‘Closing’, I assured you we would look at the IES (Institute of Education Sciences) next. Why? Section 9210 of the ESSA discusses the IES’s role in federal overreach into not only education, but our homes as well. Beginning on Line 16 and ending on Line 20, is the General Statement for this Report. “In General-not later than 18 months after the date of enactment of this Act, the Director of the Institute of Education Sciences shall complete a study on the educational impact of access to digital learning resources outside the classroom.” So what does this mean? Anytime between December 9, 2015 and July 9, 2017 this Study will be conducted! 1) Analysis of student habits related to digital learning resources outside the classroom. 2) Location of where the resources are. 3) The types of devices and technology used for educational purposes. 4) Barriers students face in accessing digital learning resources outside the classrooms will be identified. 5) Descriptions of challenges students without home internet access face daily. 6) Related challenges to #5 will encompass a student’s ability to complete homework as well as how engaged in the classrooms they are. It will also measure their participation in class. 7) How the challenges of #5 and 6 impact a student’s educator and their instructions. 8) How SEAs and LEAs (State Education Agencies and Local Education Agencies), schools, P3s (Public, private partnerships), and others can develop ways to break down the challenges and barriers of digital learning access outside the classroom. What follows the Contents of the Study? How the Director of the IES will include the general public in results of the Study. What other groups get the results? The Committee on Education and Workforce (U.S. House) and the HELP (Health, Education, Labor, and Pensions) of the U.S. Senate. Finally, all this data will be shared electronically with the U.S. Dept. of Education and posted to their website. Warriors Against the Core: Do you see the process? Do you realize the implications? Do you recognize the 2 main parties receiving the results (Congress and the Dept. of Ed) are the same ones who help plot and plan the HR5 and the S1177 which were combined to give us the ESSA?! The HELP, the Ed/Workforce also have their hands on the SLDS (Student Longitudinal Data System from the U.S. Dept. of Ed); are helping oversee the re-authorization of the HEA (Higher Education Act); have access to the WQDI (Workforce Quality Data Initiative from the U.S. Dept. of Labor); and will now be measuring our students OUTSIDE the schools! So where does this usually point? Homes! After school programs! Will this include their trips to Grandma’s or a favorite hang out location where they meet friends, too? While not specified, the descriptions in the language are so opened ended, it does make you wonder. Well, if the IES will be measuring our students and homes so up close and personal, maybe we should be looking at THEM rather closely. From what I have been able to find, the Study mentioned in the ESSA is not available on the IES website. However, I have been able to find some related documentation which may help us in our War Against CCSS. For example, the IES is great about granting large sums of money to others in the name of research. I was able to find one such grant given to UCLA back in 2008. The sum? Over 9 million dollars. The name of the grantee, specifically? National Research and Development Center on Instructional Technology: Center for the Advanced of Technology in Schools (NCATS). The money was good for 5 years. 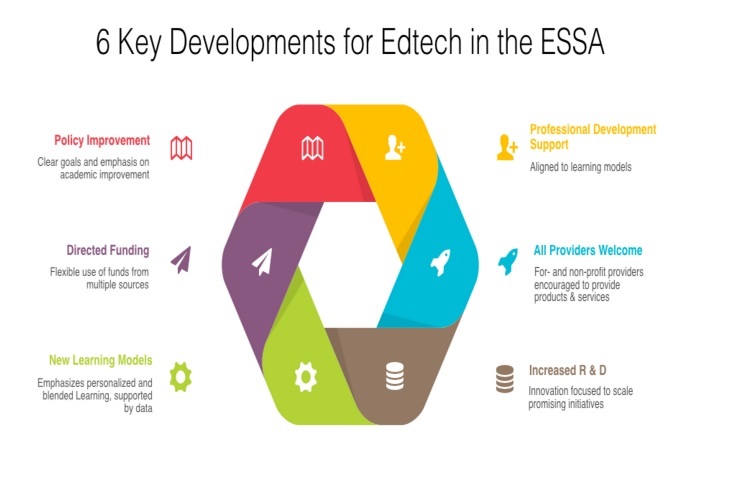 If you are curious as to the picture I included showing the dollar amounts for technology in the ESSA, please see the rest of the article, you won’t be disappointed. Lastly, the recent announcement of the White House Initiative for Computer Science for All? Yep, same agenda, same players from the CCSS Machine, and our tax dollars are joined together to continue the grinding down of our educational system and all those involved! No CCSS Resource has all 7 pillars of traditional education. It CAN’T based on it’s illegal nature. “What a tangled web we weave, when we practice to deceive.” How many of us remember learning this as a child? Common Core Standards, the CCSS Machine, and those running it attempt to deceive us every single day the illegally based Standards are allowed to exist. It’s ‘Back to School’ season. That means parents shopping, which means money is being spent. It means corporations (ESPECIALLY those embedded in the CCSS Machine) are dangling new resources, products, and technology in front of everyone from the school staff to the state levels of education decision making. It means the CCSS Machine is pumping out big volumes of ‘white paper research’ to back up WHY CCSS/CTE (Career and Technical Education), CCR (College and Career Readiness) is a ‘must have’. (Don’t forget with each of the above, you have STEM, STEM to STEaM, Next Generation Science Standards, the C3 (CCSS aligned Social Studies), and so much more that’s egregious! No matter how many ‘back to school’ seasons we get where CCSS is being rammed down our throats, the pattern’s the same. Hype up the Common Core and all its related crud and you’ve got ‘credible’, ‘new’ research to support it. BULL! As I’ve shared with you before in my ‘subjective’ vs ‘objective’ anti CCSS article, you CAN’T call research or studies conducted by the SAME folks corrupting education AND use them as your ‘evidence’ as to HOW CCSS is a proven success. IT’S called CONFLICT of INTEREST! In the picture I provided above, I stated in the caption that ‘no CCSS Resource has all 7 pillars of traditional education.’ My fellow Warriors, CCSS by its very existence has NONE of the 7! 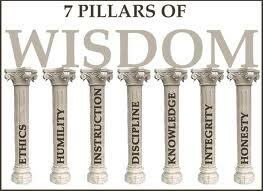 The 7 pillars you see above: ethics, humility, instruction, discipline, knowledge, integrity, and, honesty are attributes. Together, they make up true wisdom. What’s an attribute? In its noun form, ‘attribute’ is a quality regarded as a part of yourself that’s inherent. In other words, it is deeply rooted in your character. Character, as we know, takes YEARS to develop. It takes real life experiences. No computer device or program can teach attributes in their true sense. Yet, during “Back to School” season, the CCSS Machine will promote…. There’s more in the middle than ‘attributes and ‘capabilities’. The symbols you see? Oh, those are all the computer based programs which are to being used to ‘teach’ attributes! You’ll definitely want to see all the others words littered throughout the circle. You’ll be able to recognize some of the more well known pro CCSS corporate logos. Ones like Facebook and Google, but, oh my..there are TONS more right in front of you! Be sure to read the comments. They are all from foreign countries expressing how great learning like this is! If you learn best visually, this is fine. However, no every child learns visually! Middle School and High School ST Math doesn’t use the same wording, but it does use ‘remediation’ and ‘intervention’ as well as pointing back to the K-6th program. 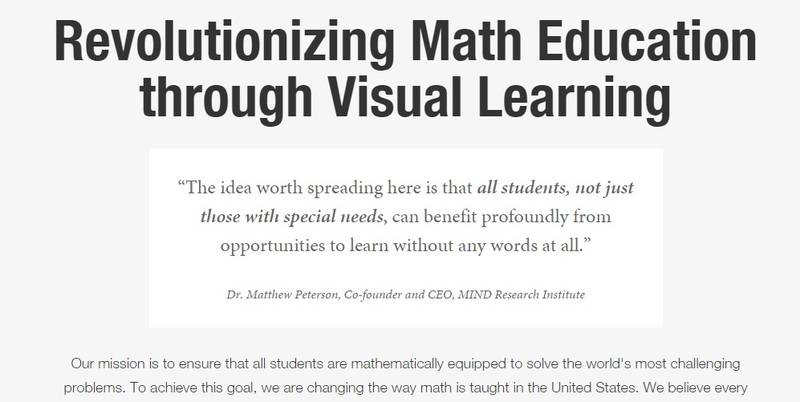 Among 2013 donors/supporters of the MIND Research Institute Math program? 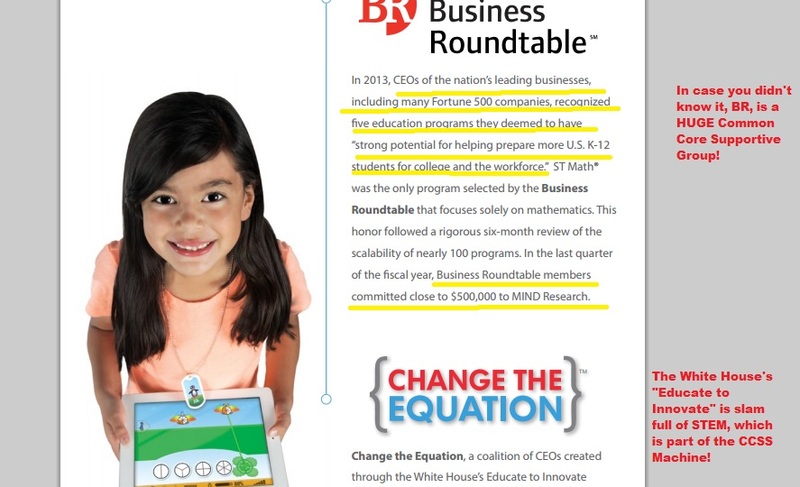 BR (Business RoundTable) and the White House’s “Educate to Innovate” campaign. To access the 2013 Annual Report: MINDInstitute Why do you need this? It contains the vision of expanding the math to college levels so those earning teaching degrees can teach this! You’ll also get to see who or what group donated to the Institute. Some heavy hitting CCSS backers are included. Be sure to look at the “At a Glance” page. You’ll see all kinds of federal overreaching plans. Plans that very much are STILL being decided in D.C.! Plans that involve birth to career education! Want to dehumanize character via CCSS, easy..just use a computer to teach everything.